Asus has revealed the VivoBook 14 laptop on its website ahead of CES 2018. The VivoBook 14 comes with options of up to an Intel Core i7-8550U CPU and an optional NVIDIA MX150 GPU along with several storage options and will be have an official presentation during CES 2018. 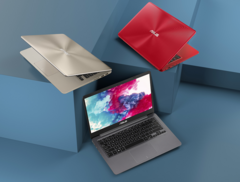 Asus has listed the VivoBook 14 on its website ahead of CES 2018. The VivoBook 14 comes in two variants - the X411UA and the X411UQ. The X411UA comes with integrated Intel HD graphics while the X411UQ comes with a dedicated NVIDIA GeForce MX150 GPU with 2 GB VRAM. Both models come with 8th generation Intel Core 'Kaby Lake-R' CPU options including the dual core Core i3-7100U, quad core Core i5-8250U, and the quad core Core i7-8550U. There's also the option of choosing between a 1366 x 768 TN panel or a FHD IPS panel. RAM options range from 4 GB to 16 GB and the storage subsystem is a combination of SSD and traditional HDD. Despite the slim form-factor, the VivoBook does not skimp on ports and comes with one USB-C port, one USB 3.1 port, and two USB 2.0 ports along with an HDMI out port. A combo audio jack, VGA webcam, and an SD card reader round off the other features. At just 20 mm thick and weighing about 1.35 kg, the VivoBook has the potential to be one of the most sought after ultrabooks in 2018, given its decent specs and configuration options. The 42 Wh battery should be able to hold enough charge to last at least 6 hours of a typical workday. The Asus VivoBook 14 is expected to be officially unveiled during CES 2018, which is when we will get to learn about more about its pricing and availability.